The 147AX Pressure Rugged Microphone has been specially designed to achieve repeatable measurements in positions that are hard to reach with other types of microphones. This makes it a perfect choice to place in the response positions for TPA measurements in the engine bay of a car. Its small and rugged design allows for microphone mounting in places that were otherwise impossible. Furthermore, the magnetic base of the 147AX enables easy positioning on any metal surface and the included mounting disc will ensure the exact same microphone position for future measurements. GRAS 147AX operates in the -40 to 125 °C (-40 to 257 °F) temperature range and is designed to be water and dust proof (IP67). It therefore, will survive even the most challenging engine bay environments. 147AX is a rugged surface-mounted pressure microphone optimized for engine compartment testing in the automotive industry. It combines the high precision and stability of a laboratory microphone with a high level of ruggedness, including the ability to function properly in the most challenging environment with vibrations, oil mists, water spray and dirt and dust - and high temperatures up to 125°C. With the 147AX it is now possible to introduce a considerable improvement in the way acoustic engine compartment measurements can be done. The small form factor makes it possible to place the microphones where size constraints previously prevented so. Also, the microphone system's resistance to heat, dirt, oil mists and vibrations make it possible to make hot engine tests under real life conditions. A novel mounting system (MagMountTM) makes it easy to mount precisely and ensures very good repeatability, even after full dismounting of the microphones. 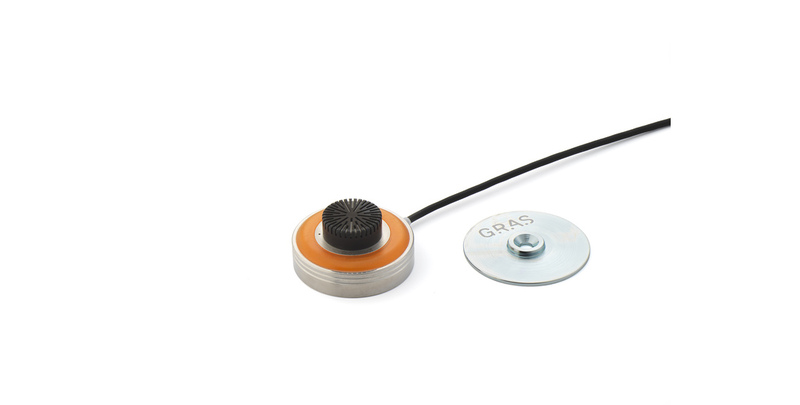 Like other members of the GRAS family of microphones for automotive NVH testing, the 147AX is designed to perform optimally under the rough conditions encountered in automobile NVH testing. A new design of the preamplifier and other internal parts makes it resilient to shock and vibrations. It functions well under conditions with vibrations and g-forces from uneven road surfaces and other sudden directional shifts as encountered in real-life driving tests. The most vulnerable part of any condenser microphone is the diaphragm. In the 147AX a more robust type is used. It can be replaced during repair, keeping maintenance costs at a minimum. The microphone set works properly up to temperatures of 125°C/257°F. The integrated cable is a high-temperature type. This means that the 147AX can be mounted closely to heat-emitting components and will provide reliable data in all realistic use scenarios. The microphone-preamplifier assembly is effectively sealed against moisture and is IP67 rated. Special protective water and oil repellent coating adds further protection and makes it easy to clean. The microphone diaphragm is protected by a grid which has a comprehensive multi-layer filtering system which ensures good protection against high-velocity particles and prevents dirt and dust from polluting the microphone. Provided that the protective grid is replaced at appropriate intervals this system ensures that the microphone will function properly even in very dirty conditions. The filter also protects the diaphragm against water splashes and oil mists. A customized wind screen is available. Even when turbulence is not a problem it can be used for further protection. A special connection system with added strain relief is used to provide a robust and water tight connection (IP67) and is sufficiently robust to endure the intended use scenarios. The cable can withstand temperatures up to 125°C/257°F and is oil resistant - if subjected to oil the insulation will not become brittle. The cable and its connection to the microphone are resistant to even heavy vibrations. A number of cable replacement kits are available for user replacement of the cable. In this way, possible downtime is reduced. Compared to traditional, tube-shaped 1/2" microphone sets that are mounted with tape or holders attached to the engine and/or its auxiliary equipment, the 147AX is a surface-mounted microphone designed to be mounted on flat or lightly curved surfaces, for example on the engine compartment walls/boundaries. This normally requires mounting methods that make dismounting difficult and potentially destructive, for example glue. Such methods can of course still be used, but the new magnetic mounting system called MagMountTM is much easier to work with and provides the basis for better measurement results. The MagMountTM mounting system consists of a flat metal disc which functions as a mounting base for the microphone, and a magnet at the rear of the microphone housing. The flat metal disc is for mounting at the designated mounting point and can be secured with glue, double-sided bonding tape or a screw. Using the double-sided bonding tape delivered with the 147AX ensures an extremely strong mounting, but using glue may also be a good choice. When the microphone is placed over the mounting disc, a center guide ensures that the microphone will be attached and centered to the disc correctly once the magnetic force kicks in. In this way, it is easy to mount in difficult-to-access locations with no loss of placement accuracy. This mounting system makes it possible to mount and dismount the microphone repeatedly even in difficult-to-access spaces where you cannot see what you are doing. When a microphone is dismounted and later remounted, the difference between these two mountings will be only a fraction of a millimeter. In this way, variations in transducer position from test to test are minimized, ensuring very good repeatability even if all microphones have been dismounted between measurements. Also, transducer placement inaccuracies due to operator error are no longer a problem. This system makes it easy to document how microphones have been placed during a given test, and it makes it possible to identify and prepare measurement positions at an early stage, e.g. before the room in which they will be used is finally assembled. Combined with the 147AX's ruggedness - in this case, its ability to handle heat and vibrations - this also makes it possible to retain a measurement setup with the same measurement points, even when transitioning to hot engine testing and prolonged testing on proving grounds or public roads. Even though the microphone will be firmly attached to a vibrating structure, this fact will not prevent proper operation. The microphone itself and all interior parts are designed to work correctly when vibrating. Furthermore, the diaphragm is extremely lightweight with a very small mass. This means it will not react to the vibrations in the same way as an accelerometer at the same location would. Below its resonance frequency at 18kHz, the low mass and high stiffness of the diaphragm reduce the influence of structure born vibrations. Even at the resonance frequency at 18kHz, the dampening is sufficient to prevent a peak similar to that found in accelerometers. Compared to using traditional tube-shaped microphone sets attached with tape or holders, 147AX’s mounting method is much more stable AND less sensitive to vibrations. Therefore, at the noise levels expected to be found in the engine bay, the 147AX provides a good signal-to-noise ratio even when mounted on a vibrating structure. As a surface-mounted microphone, the 147AX can be used where a traditional 1/2" microphone set is too big. Low height allows for placement in difficult-to-access small cavities and near hard reflective surfaces, making it possible to install a microphone where a traditional ½” microphone set is too big to use. As modern engine rooms normally are densely populated this can be a major advantage. This advantage makes it easier to define microphone placement and to have identical setups over a long time and across models to document the effects of changes. Also, it will often be easier to place microphones close to the individual noise sources that need to be investigated. The 147AX is a pressure microphone. Where a free-field microphone is designed with a high-frequency roll-off to compensate for the effects of its own presence in the sound field, the response of a pressure microphone is flat. Therefore, when mounted at the boundaries of the sound field inside the engine compartment, a low-profile pressure-field microphone is the better choice, especially at high frequencies. A special windscreen is available for 147AX and can be a viable option when it is placed in close proximity to air flow, e.g. a fan. An integrated LED gives status information on power up and checks, making it easy to verify that the microphone is ready to measure. If there is a faulty connection, the LED will not be lit during power up. The LED will light up when the TEDS chip is read. The comprehensive precautions taken to make the 147AX immune to adverse test conditions result in a number of benefits that all translate into time saved and lower costs of ownership. The total life span of the microphone set will be many times that of a conventional microphone set that must be discarded due to damage from dirt, moisture, shock, and vibrations. Also, system and set-up related costs are minimized due to the precise and easily reproducible location of the microphones enabled by the MagMountTM mounting system that makes well-defined measuring points and highly repeatable measurements possible. The 147AX is a pressure microphone. Unlike a free-field microphone, it will not underestimate the sound pressure in the pressure-field conditions inside an engine bay. The same microphone set can remain mounted in a test configuration for extended periods of time or remounted very quickly. Measurement points can be identified and described precisely. Measurement setups can be recreated easily and precisely, ensuring very good repeatability between measurements. Separate test results are immediately comparable because the same stable microphones are used at the exact same positions. TPA and hot engine measurements can easily be compared. The protection grid with its protective filters can easily be replaced, for example before dirt and oil mists are clogging the meshes. The CCP (Constant Current Power) technology allows for a low cost per measurement channel. These advantages mean that the 147AX not only ensures a low cost of ownership, but will also contribute to speeding up the development process by improving the quality of your measurements and reducing set-up time, factors that translate into competitive advantages. The 147AX requires a constant current of 2 mA and a BNC connector. Ready to use standard coax extension cable assemblies of various types and lengths are available. Waterproof, heat and chemical resistant extension cables are also available. It is IEEE 1451.4 TEDS v. 1.0 compliant. If your measurement platform supports Transducer Electronic Data Sheets (TEDS), you will be able to read and write data like properties and calibration data. For daily verification and check of your measurement setup, we recommend using a sound source like the GRAS 42AG Multifunction Sound Calibrator with the calibration adapter that is part of the delivery. Calibration Data for each individual microphone set can be accessed online via the serial number. In this way, you can easily download and configure your analyzer with calibration data. Accessible on-line are also correction data for the protective grid in a format that your analyzer can read at www.gras.dk/e-data. When our R&D team develops a measurement microphone, it must undergo the most demanding tests to prove that it can withstand our customers' daily test conditions. Using a series of Highly Accelerated Lifetime Tests (HALT) we ensure that our microphones live up to the high quality and precision that our customers have come to expect and trust. Our HALT tests actively accelerate the lifetime of a microphone by simulating the handling and use it is exposed to in real life situations. By stress testing to the limits, we have been able to optimize the design for robustness and stability. GRAS Accredited Calibration is performed by the GRAS Accredited Calibration Laboratory that has been accredited in accordance with ISO 17025 by DANAK, the Danish Accreditation Fund. If you want a new microphone set delivered with an accredited calibration instead of the default factory calibration, please specify this when ordering. All parts are manufactured and assembled at the factory in Denmark by skilled and dedicated operators in a verified clean-room environment. Our warranty against defective materials and workmanship is 5 years. 147AX is patended in Europe.